The Annual Festival of Khwairakpa Erel Umanglai Khuvam (shrine) is being held every year in 2nd Sunday of the month of Wakching (January 4, 2015) (Wakching gee anisuba nongmaijing) by the Manipuris from the time immemorial at which thousands of devotees from within and outside Assam come and worship. It is known as Narayandar 0r, Nararandar to the non manipuries. 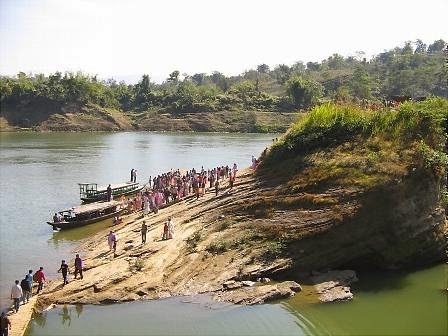 The unique and interesting feature of the festival is that the devotees, in thousands reached the shrine at the River Island situated in between Jirimukh and Fulertal (Cachar) Ferryghat of the Barak River by water-ways in boat and the speedboat.